Non-destructive: Nothing is baked in. Imerge Pro keeps your changes live and your color data RAW. Retain the full range of colors and gradients in that 16-bit California sunset throughout the editing process. 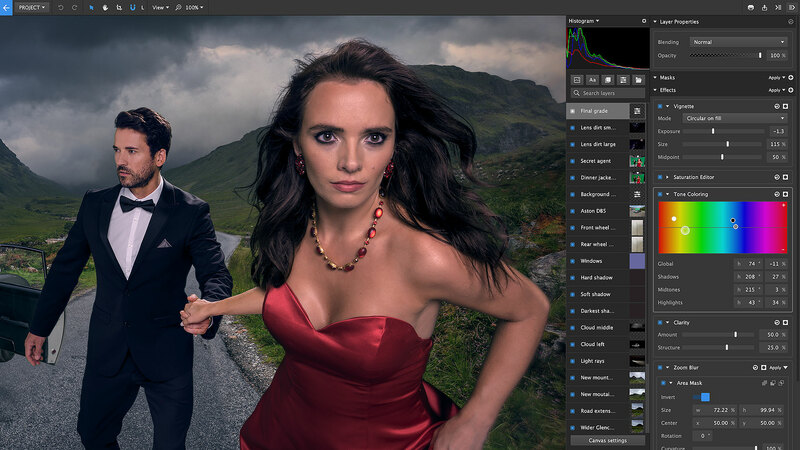 RAW processing: Imerge has a powerful bespoke RAW engine which gets the best out of your images. Custom-built and GPU accelerated, it gives you lightning-fast speed when importing any RAW images. Your files at your fingertips: Imerge Pro's unique home screen has already found all the projects on your system, so you can just open them and get started. Project templates or custom setup: Quickly choose from presets, or set your own canvas resolution and shape. Does all image processing in 16-bit float. Client preview on second monitor: Impress clients and passing customers at shows with a clean, full quality preview on a second screen, with all interface elements hidden. Standard formats including: JPEG, PNG. High-quality formats including: TIFF, RAW. Specialist formats including: EXR (single-layer RGBA), HDR & PSD (flattened). Export formats: You can adjust the following file formats to control the compression used in the exported image: JPEG, TIFF, PNG. We support metadata: Stored metadata including: EXIF, XMP & IPTC. Layer content: Layers can be made up of multiple images and will provide the ability to export all the combinations. Multiple outputs: Export a number of delivery formats so your content is client ready or Instagram ready from the get-go. Content variations: Give yourself ultimate freedom - export multiple backgrounds, foregrounds, text layers to create hundreds of different iterations. Chroma key: Look, no hands! Throw out the rotobrush and let Imerge do all the hard work for you. Never slave over erasing fine hairs or lace detail again. Color difference key: Use this great effect with images that contain transparent or semi-transparent areas, such as smoke, shadows, or glass for a detailed and realistic key. Luminance key: Remove fire and explosions from black or white backgrounds with the intelligently designed Luminance Key. Let it select the pixels that need to be semi-transparent and see results instantly. Spill removal: No use crying over spilled green screen. Don’t be afraid of the dreaded green shadow again with automatic Spill Suppression that neutralizes the shade and removes unwanted spill. Masking is used to manually create a matte. A matte determines which parts of a layer are visible. Practically, this means that masks can be used to cut holes in your layers. But that’s not all - they can also be used to define where a filter is applied! Mask around just the eyes, or alter the exposure of the sky in a landscape quickly and easily. Gradient: Easily fade images together, fade to black and white, fade text or even create a photo reflection with a gradient mask. Area: Use an area mask to hide portions of a layer and reveal the layers below. Perfect for combining multiple photos into a single image or getting rid of unwanted details. Vector: Imerge’s vector masks are not pixel-based, and as a result are much more accurate. Image luminance (intelligent): This incredible feature breaks an image down into channels of luminosity so that users can mask based on how bright or dark an area is. Image color selection (intelligent): Much like luminosity, image color selection breaks an image down into color ranges, so that users can easily make specific selections based on color. Black & white: Convert your image to black and white, or reduce the saturation of your image. Imerge Pro’s black and white tool gives you full control over the luminosity of specific colors in your image, so you can dial in the exact results you desire. Bleach bypass: Based on a technique originating in film processing, where the bleaching step was completely or partially skipped during development. Bleaching typically serves the purpose of removing silver emulsion from the film. The result is a dramatic image with high contrast and low saturation. Channel viewer: Quickly exchange individual channels in your image into other results. They are typically used as a diagnostic tool inspecting a particular color space channel from an image. Clarity: This effect allows you to manipulate the local contrast in an image. Clouds: Generate a randomized fractal pattern simulating the appearance of clouds. This is most commonly combined with other effects to produce computer-generated patterns and textures. Color adjustment: Your image can be altered with this tool to correct colors when required, or to alter colors for artistic effect. Color overlay: Adds a color to all the pixels in an image. It will not affect the alpha channel so the shape of your image will be retained and only the color will change. This can be useful for making silhouettes by filling it with black or more creative graphical uses with images that are imported and have an alpha channel. Curves: Curves are a powerful tool for adjusting colors and tones within your image. The graph displays a histogram of all the values present in the currently selected channel. The diagonal line is the curve you will edit, and it represents the relationship between the input values and output values of your image. Dehaze: This effect can add or remove mist or haze from your shots. Create spooky looking scenes, or turn a gray sky clear with a single slider. It does so by estimating the distance each item in your image is from the camera at the time of the shot and adds or removes white based on this distance along with the amount you specify. Directional blur: This effect blurs the image in a specific, user-defined direction. Exposure: Benefit from all the flexibility and power of working with RAW when editing that cloudy landscape image. Recover blown out highlights in the sky with a simple slider using Imerge’s impressive Exposure effect. Gaussian blur: A simple blur which blends each pixel with the pixels surrounding it on all sides, to a radius defined by the user. Grain: Adding grain to your images can be useful for a variety of purposes, including matching existing grain in other elements of a composite, artificially aging an image, or artistic purposes. Grain is similar to noise, but more organic in nature. Inner glow: Applies a glow effect to the inside of the layer’s edges. The glow is applied as a gradient, which fades out as it reaches farther into the image. Invert: Invert individual channels of the image. By default all color channels are inverted, which inverts the entire image. You can also invert specific channels individually. LUT (look-up table): Look Up Tables (LUTs) are files which store a specific map for color adjustment, and allow you to apply a pre-defined color grade or adjustment to your layer very quickly. Levels: Levels gives you detailed information about the channel composition of the layer through the user of a Histogram Display. This histogram shows information about the image just before the effect is applied. This allows you to make adjustments to the tonality of the layer based on this information. Light wrap: Keep your green screen composites looking super realistic. Light wrap adds realism to your subject by simulating light sources in the background wrapping around the edges. Linear gradient: Create the perfect sunset look, or give your image some more depth with our linear gradient effect, which creates a gradient between colors of your choice. Noise: Adding noise to your images can be useful for a variety of purposes, including matching existing noise in other elements of a composite, artificially aging or distressing an image, or artistic purposes. Outer glow: Applies a glow effect to the outside of the layer’s edges. The glow is applied as a gradient, which fades out as it reaches farther from the edges of the image. Perfect for simulating a sun, or light. Outline: Creates a solid line along the edges of the layer. Pattern overlay: Enables you to apply another image as an overlay onto the layer contents. The selected image is applied as a tile pattern, so it always fills the entire contents of the layer. Pixelate: Go full FBI with the Pixelate effect. Hide someone’s identity, or a number plate on a car by selecting a specific area, making it look far lower resolution and blowing up the size of the pixels. Quad warp: Reposition the corners of a layer individually, to alter its perspective or to alter the scale of its contents non-uniformly. The effect provides controls for each individual corner of the layer. Radial gradient: Perfect for that sunny look, use a radial gradient to change one center color to another color at the outside of the radius. Remove color matting: Eliminates halos from the edges of composited elements where the background has been removed. When a composited element has unwanted color around the edges, you can use this tool to remove that color, while still retaining transparency in those edge areas. Saturation editor: The saturation editor is optimized for fine tuning the intensity of each color in the layer. It uses a curve to control the saturation of different colors. Scan lines: Creates a consistent pattern of light and dark lines. Effective for replicating the look of television or other electronic displays, or creating a pattern for graphic purposes. Sharpen: Increase micro contrast around fine edges on the image, which causes the edges stand out more and appear to be in sharper focus. Tone coloring: Tone coloring applies hue shifts to specific tonal ranges of your layer. Unlike color adjustment, which applies adjustments based on color selections, Tone coloring alters color based on tonal selections, or luminosity. Vignette: Subtly or dramatically darken the edges of your frame using this effect. Vignettes help to naturally draw the viewer’s eye toward the center of the frame, and your subject. White balance: Correct the color of inaccurate whites with this tool. You can also use it to warm or cool the colors in the image overall. You can manually correct the white balance using the temperature and tint sliders, but it is usually faster and more effective to start by setting the neutral color. Zoom blur: This effect works by blurring the image outward from a specified center point. It creates a similar effect to quickly extending a zoom lens during an exposure. Imerge Pro is multi-core and GPU accelerated. For the best performance it&apos;s recommended to update your GPU drivers to the latest version before running Imerge Pro. Imerge Pro comes with a range of free training resources to support you. While you learn, our online support systems are ready to provide you with technical guidance. Free video tutorials: The FXhome YouTube channel contains hundreds of videos educating our users on different FXhome software. Take a look at the Imerge playlist to see our newest tutorials. Online community forum: If you’re looking for hands-on tips and tricks and can’t wait for another tutorial to come out, our forum are the place to be. With an extremely active and friendly community of users you’ll have the answers you need in no time.